Dr. Fuller: Oh, you mean like, uh, an angel on your shoulder? Sam: No, no. 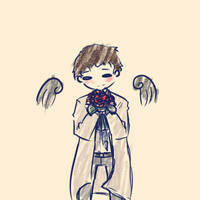 His name's Castiel. He wears a trench coat. Dr Fuller: To be frank, the relationship you have with your brother seems dangerously codependent. I think a little time apart will do you both good. Dr Erica Cartwright: And you’re my paranoid schizophrenic with a narcissistic personality disorder and religious psychosis. Dean: Crazy is the clue! "Everybody gets pudding! Chocolate Pudding! Chocolate Pudding!" Hahahahah xD I love this! Me: Shut up and eat your pudding. And will it kill someone to give me my f"king pie!? Every time i get pudding i am going to do this!!!!!!!!!!!!!!!!!!!!!!!!!! Great but... Unwatch me please. I'm not on the GIF and I wouldn't like if someone watches me for things that are not mine. Thanks. thanks even though i haven't been a member for long i've love this site!!!!!!!!!!!!!!!!!!!!!!!! Why does this look similar to a fat guy's Harlem Shake? OMG YOU WERE COSPLAYING AS CAS CAS IS AMAZING. YOU THREE ARE AWESOME. For Halloween, me and my two supernatural friends dressed up in gender-bender supernatural costumes. ~FireSaphire was Cas, I was Sam, ~Sugarrat77 was Dean, and ~TheTexasSongbird45 was Bobby. BEST DAY EVER. He kinda looks like a kid Jensen in this gif. We fight our way till the end..